“Personal Reflections: My Leap of Faith” from Christian Faith Publishing author Marilyn Kuebler Morris reveals the meaning of true faith. Some Christians feel the Voice of God and feel His Touch so strongly that they are compelled to act on their faith without question. “Personal Reflections: My Leap of Faith”: a story about a woman’s true faith. 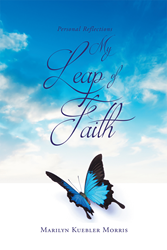 “Personal Reflections: My Leap of Faith” is the creation of published author, Marilyn Kuebler Morris. She had everything, yet she had nothing. She had tremendous pain for many years, yet she also had many miracles along her journey of faith. She should have died, but she did not. She had a childlike joy that only dimmed at the worst moments. At those times, she hid as best as she could. One thing she never lost was her faith and her love of humanity. At times, she was disappointed by man, but God always rose Supreme. Faith was all she had, so yes, she had everything. Published by Christian Faith Publishing, Marilyn Kuebler Morris’ new book shares the story of a Christian whose instinct is faith. Some Christians have a faith so strong that they rarely question it. They just believe with all their heart. They care very deeply for everyone and, sometimes, see much more than others see. These people epitomize the true meaning of faith. They do not always understand what they see and why it will be important, but they do not question it, because it is so clear to them that it comes directly from God. Some feel His Touch and some feel His Voice telling them to do certain things. They know that they must do these things, because it comes from above. This phenomenon is very difficult to explain, but so clear to those who feel it. It is not always comfortable or easy. It is, however, a gift from God that must be embraced. View a synopsis of “Personal Reflections: My Leap of Faith” on YouTube. Consumers can purchase “Personal Reflections: My Leap of Faith” at traditional brick & mortar bookstores, or online at Amazon.com, Apple iTunes store, Kobo or Barnes and Noble. For additional information or inquiries about “Personal Reflections: My Leap of Faith”, contact the Christian Faith Publishing media department at 866-554-0919.